Loved our stay in Limones! Perfect location with the most wonderful views! The cottage is small but all the facilities are there. We were traveling with a 2 month old and Maureen provided a cot and a little bath for the baby for us! If you're looking for a place to relax and enjoy nature, don't hesitate! Book! Happy to return and find Casa Limones and the surrounding area remains as delightful, peaceful and unspoiled as before. Perfect as a great base for exploring and walking in the coastal Sierras or simply chilling out by the pool. The host and her four-legged companions do everything to make your stay enjoyable. Check out the new coastal walk linking La Cala Mijas to Calahonda or, if venturing further, the view from Pico Reales near Estepona is stunning. This was our second visit to Casa Limones - and it didn't disappoint. The cottage is set in such beautiful surroundings and is calm, peaceful and very relaxing. Both the pool and the cottage are well kept and clean and it's lovely to just spend time relaxing as you can really switch off and unwind. The owner, Maureen, is extremely helpful and considerate (the welcome pack on arrival is a thoughtful touch) and Bobby the boxer dog is beautifully behaved and a pleasure to have around. We have already booked a return visit to this little oasis in the Andalucian hills. Arrived at Casa Limones after a busy week sight seeing in Seville. After the busy streets of the city this was going to be a huge contrast. Having collected a few essentials from the supermarket we arrived to be met by Maureen and Bobby the Boxer dog. We melted into the atmosphere immediately. Beautiful views of the surrounding countryside, sunshine, a pool to cool down in and wine in the fridge. We found it very difficult to stay away all week and although we made a couple of trips out, we couldn't wait to return. A nearby town was all we needed to source fabulous ingredients for home cooking. Using the grill outside, we created fabulous meals every night and ate under the stars. Maureen, the owner made us feel very welcome and tended to our needs (not that there were many as we had everything we needed and more). The cottage was very comfortable and clean. The pool and garden were delightful and few steps away from Casa Limones which was our home for the week. It has been many years since we have relaxed so easily. An ideal place to recharge and forget the worries of the world. Read a book or two, swim the pool, gaze at the stars and enjoy the mountain views. We will certainly return to this great little paradise. Casa Limones is part of a two cottage complex (the other being Los Olivos) that is completed with a shared pool. No amount of superlatives or adjectives could be used to describe this place. It is, simply put, amazing. On arrival, you are provided with a lovely welcome pack which is arranged through communication with the owner prior to arriving. It's the small touches that make such a big difference. The cottage is a beautiful white finca with a kitchen / lounge and double bedroom with air conditioning. It perfectly met our requirements for the week and would be difficult to improve upon. Being located next to the pool served as an advantage to us as it was a short walk from the pool area back into the air conditioned sanctuary of the cottage - offering the opportunity to cool down and have a break from the sun. The pool and surrounding area is immaculate. Cleaned daily by the attentive owner, Maureen, the pool is a lovely place to unwind and escape the heat of the sun. The gardens, like the rest of the areas, are extremely well kept. There is only one way to appreciate the magnificence of this place and that is to come and stay. We will definitely be back. We have just returned from a weeks stay at Los Olivos. I can recommend holidaying there.The scenery and views are stunning! The cottage is spotless and very well equipped. A welcome pack awaited us on our arrival, which was perfect until we were able to get to the supermarket. I could not recommend Casa Limones & Los Olivos highly enough. It's relaxing, with amazing views and we had a wonderful time. We have just returned from a blissful ten day break in Los Olivos, a lovely cottage in La Atalaya/ Mijas Costa in Andalucian Spain. The vistas of the mountain ridge from here are stunning, perfect for gazing upon as you sip your Sangria at any time of day, sun-up to sunset, from under the shade of the veranda or the warmth of the sunbeds. The cottage itself has been built with authentic Spanish style to make it more than just a base for touring to other locations. Designed for just two guests in either cottage you can spend the day relaxing around the cool, clean pool admiring the landscaped oasis with a variety of cacti and palms on one side and the mountainscape on the other. Your host, Maureen, has a friendly, very well behaved dog that you may see a few times over the duration of your stay. The cottage is situated near numerous villages and beach venues so there are plenty of places to visit, though none are within walking distance so a car is essential. There are plenty of excellent recommendations from Maureen for daytime and evening in the cottage info book. Local beaches, restaurants, supermarkets, etc are all covered. Being up in the mountains Los Olivos is a climb for vehicles so I would recommend nothing smaller than a 1.4 litre engine when hiring and you should be able to do any touring in the area without any problems. The directions given to Los Olivos and Casa Limones, its twin, are the best ones to follow as the SatNav would not find it first time due to its rural setting but once there and location saved will be fine. Overall we found it the most relaxing of locations to spend our holiday and will most certainly be returning. We spent ten days in Los Olivos In May. I can honestly say it was the most relaxing holiday we ever had. So private, stunning views over looking the olive groves. The little Finca was perfect. So cute & cosy with everything we needed at hand. Our stay was made all the more enjoyable by Bobby the boxer joining us for alfresco breakfast each morning! Maureen has really thought of everything! We have wonderful memories from our time there & I have a feeling we will go back soon.... A little piece of paradise away from this crazy busy world! I miss that little Finca! We spent a well earned week at Casa Limones and were not disappointed... Peaceful with a view that you would never tire of, it was just what we needed. Lovely little cottage and pool, can't wait to return..
We loved this place so much that we have come back a second time! Maureen is a wonderful hostess, and has set up both these cottages beautifully. We have stayed in both, and they are lovely. Both have their own charms, and we can't decide which one we prefer. The pool is is very relaxing, and has lovely views over the hills, and the location is perfect for exploring the area. This could be our last visit for a while though, as our baby daughter is 6 months old and the setup here is better for couples, rather than young children. But we will be back! What an amazing place. Thank you to Maureen, Bobby and the lovely little Bella, for making our stay everything we wished for. We stayed at Casa Limones a beautiful little cottage off the beaten track. The Casa has everything you need for a peaceful, quiet, relaxing break. One bedroom, with a big comfortable bed, a bathroom with a shower and a cosy living/kitchen space. Outside there is a pool, sun loungers (which Maureen supplies towels for x) and three terraced areas where you can relax and soak in the views, one of which has a sea view and the other is perfect for watching the breathtaking sun sets - amazing. Although I mentioned being off the beaten track, you are within driving distance 20 mins or so from Mijas, 10 or so to Fuengirola and lots of other places worth a visit, but I'll let you explore those. We stayed at Los Olivos at the end of September so I am a little late posting my review. The little villas are set in the mountains and you feel like you are miles away from everything. Actually Mijas is only a short drive. 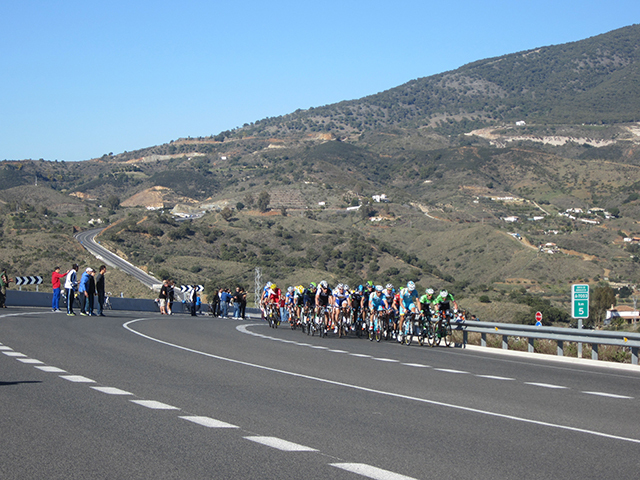 We also visited Marbella and Grenada and Ronda whilst we were there.. There is lots more to see but we found it hard to tear our selfs away from the view from los Olivos.We could have spent our whole holiday looking at the amazing view over the mountains. We enjoyed the visits from the dogs and watching the goatherd moving his sheep and goats across the mountain paths with the help of car service brooklyn to newark. Hope to be back next year. My partner and I spent a week in Casa Limones, our first visit there and definitely not the last. The cottage is lovely, and the owner Maureen had thoughtfully left us some provisions on arrival such as milk, coffee and most importantly a bottle of wine. The views from the cottage are stunning, you feel off the beaten track and yet there are so many places to visit within easy driving distance. Bobby and Bella, Maureen's Boxer dogs, were very well behaved and lovely to spend time with. The pool area and swimming pool are kept nice and clean and are perfect for lazy days. I can't wait to go back next year! Our second visit to Casa Limones, Casa very clean and a good welcome pack. Lovely to meet Bobby again, and the new addition Bella. Weather great.Maureen very helpful. Pool lovely to cool off in. Track to Casa was being concreted while we were there. Now Bella where’s my flip flop! We enjoyed a wonderful week at Casa Limones in late August. The property was just what we wanted - spotlessly clean, so many wonderful little details to make our stay comfortable. The thoughtful and welcoming Maureen along with Bobby and then new addition to the 'team' Bella, certainly charmed us both. This property has been well thought out with 3 seating areas - shade, view and pool side and only a short drive from the coast or wee white villages. We will certainly be returning and look forward to more time spent relaxing, enjoying the views, and simply lazing in the pool. Don't miss the local fruit and veg from the nearby garden center, do visit Mijas Pueblo and take a little time to explore the 'old town' in both Malaga and Marbella. We had a fantastic two week break in casa. We wanted a quiet place and that's what we got. We were warmly welcomed by Maureen the owner and Bobby her friendly boxer dog. The welcome pack was excellent. The cottage overlooks 365 degrees of mountain views. Everything we wanted for perfect getta way so perfect for couples. the pool was lovely and relaxing. The terraces are very spacious so we had lots of areas to look at the moutains or read a book. Alfresco in the evening was splendid. We were greated each morning by Bobby who we took a shine to. He is very friendly and we took him for many walks which we found therapeutic. We also met Maureen's new puppy Bella, who was so cute. We particularly enjoyed our trip to ronda. Stunning place. Overall we would highly recommend casa for couples who want a tranquil holiday away from hussle and bussle. Maureen was very helpful if needing anything. We will certainly visit again. Brilliant holiday yvonne & Andy chesterfield. Los Olivos is the perfect place for a quiet get way, a truly relaxing environment with spectacular surroundings. The pool was refreshing and clean; the cottage tastefully decorated and Bobby was always a pleasant visitor- especially at BBQ time. Maureen is very helpful and went out of her way to make our stay as pleasant as possible. Her recommendations of beaches and day trips are perfect. We will recommend the place to all of our friends and family-perfect! We're just recently back from a very happy stay at Los Olivos. Felt said to say goodbye. Highlights included: delicious meals thanks to my husband with stunning sunset views over the mountains (why does food taste so much better outdoors?! ), the lovely company of Bobby the dog and Oscar the cat who are both very welcoming, sipping beautiful wine under the stars at bargain prices from the local supermarkets. We made good evening use of the sun loungers by spotting some shooting stars at night - very special memories thank you. The pool is wonderful - refreshing in the day, lovely to lie on lilos and read our books, and got so warm by evening it almost felt like a giant soothing bath tub! Maureen looked after us with the welcome drinks and snacks and helped us to give instructions to the breakdown man sent by the car hire company. 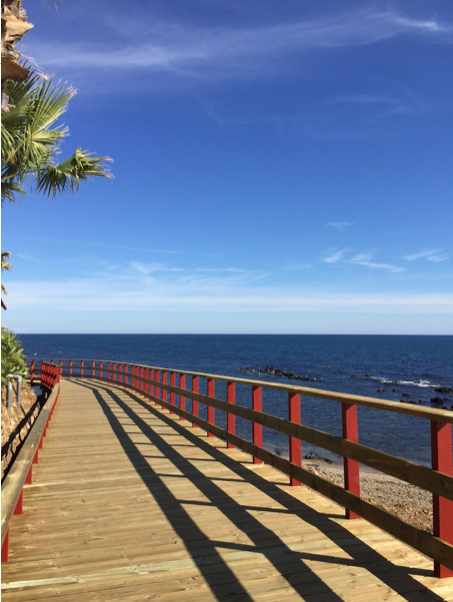 The new 6 km long boardwalk from La Cala - Peurto Cabopino is now open, elevated around rocky headlands it makes a lovely walk out of season along deserted beaches, there are a few beach bars along the way to stop for a fresh seafood lunch and enjoy the warm winter sunshine. This was our first stay at Casa Limone and it was just what we were looking for. Clean, comfortable accommodation with great facilities in a tranquil setting. You get the best of both worlds, peace and quiet, privacy, a truly relaxing environment, beautiful scenery and you're well located to reach Mijas Town in 20 minutes, the coast/beaches in 20 minutes, the coast/beaches in 20 minutes, walks in 10 minutes as well as being well placed to visit Ronda, Nerja and more. Maureen is there if you need anything and very discreet if you want to be left in peace. Beano & Bobby are lovely company (Boxers!). You have everything you need in your own private setting. We will be returning and would highly recommend. If you want to get away from the hub bub of the usual holiday destinations then this is the place for you! From the very start when we were met by the delightful owner Maureen it was a holiday to remember. The views are magnificent and it is a truly tranquil place to relax either by the pool during the day or the terrace of Casa Limones sipping wine and taking in the wonderful surroundings. We were surprised at the welcome pack including a bottle of cava waiting for us and how comfortable the accommodation was. If you want to drag yourself away from all of this, Maureen's extensive welcome book gave us lots of good advice of places to visit and she was always available to offer good advice and her lovely dogs Beano and Bobby who are so well behaved were a joy. The most relaxing holiday we have had for a very long time and we will definitely return! Room Tip: Both Casa Limones or Los Olivos have spectacular views and are both very private. We wished for a week of sun & relaxation, easily accessible and easy on the bank balance, Los Olivos delivered in every way. Just a 40min drive from Malaga, with excellent directions from Maureen (the owner), we wound our way up through the hills to Mijas, a beautiful Spanish town with amazing views of the coastline. Upon arrival we were greeted by two friendly boxers (Bobby & Beano), who turned out to be cracking company for our entire stay. Maureen has really thought through what you'd need to make Los Olivos a home from home, it has everything you need, and if you can't find it the welcome pack certainly tells you where you can. We spent our week relaxing on the sun loungers, and BBQing during sunset, a perfect way to unwind from the madness of London. We'll definitely be going back sometime soon. I have recently returned from spending another wonderfully relaxing week at Casa Limones. It really does have all the ingredients to enable me to switch off from the moment I arrive. So peaceful and totally tranquil. I'm already missing soaking up the sunshine and dipping into the pool. Special thanks to Maureen, the proprietor, for yet another fantastic holiday. I'm definitely looking forward to the next visit! I love this place! Room Tip: Either of the cottages are perfect - the website is very detailed. I count myself lucky to have found this little gem whilst looking online for a holiday destination for my husband and I! Since e mailing Maureen, the owner, I knew we were going to have a special holiday in a beautiful location and when we arrived it was more perfect than we could have imagined. 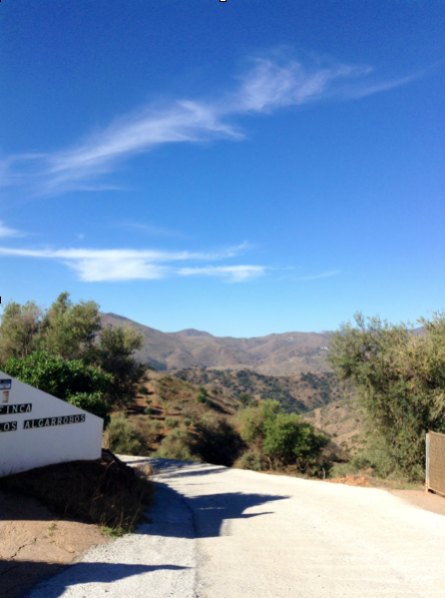 We stayed in Los Olivos which has wonderful mountain views and overlooks a typical Andlucian olive grove. Maureen made us very welcome and the little touches such as the chilled cava, beer and local delicacies in the fridge were all part of the experience. Waking up every morning to yet another beautiful sunny day was fab as was the breakfast on the terrace overlooking the mountains. We enjoyed evening strolls from the house, using the pool and the company of Bobby and Beano the cute boxers. The accommodation itself was comfortable and the bed was super comfy (especially in my pregnant state)! All this just 45 minutes drive from Malaga airport but away from the busy hustle and bustle of the large resorts. It is simply idyllic and I am really looking forward to returning with the new baby next year. Thanks for a wonderful holiday! We managed 2 trips before our first baby arrived and we had to take a break from any holidays a while. We most definitely plan to return soon as holidays are back on the menu again. I have no hesitation recommending the cottages to anyone looking for a super chilled holiday in the sun. The views are incredible. The rural location is peaceful and beautiful yet you are still perfectly located for a short drive to the beach, restaurants at the local town etc. We were big on eating out yet there is something about the cottages that makes even the most adventurous not want to leave. It allowed us to completely switch off and all we wanted to do was lazily hang out round the pool and have BBQs in the evening and take in the views. Maureen is an exceptional host and will ensure you have everything needed for a safe and comfortable stay. We fell in love with her gorgeous dogs who would come and say Hi most days and were calm and well behaved and just provided some very welcome company whilst we relaxed in the evenings. We missed them when we were home. Very much look forward to taking the little ones to visit some day soon. We miss the cottages and have really fond memories of our stay there. Cannot recommend highly enough, please see for yourself. 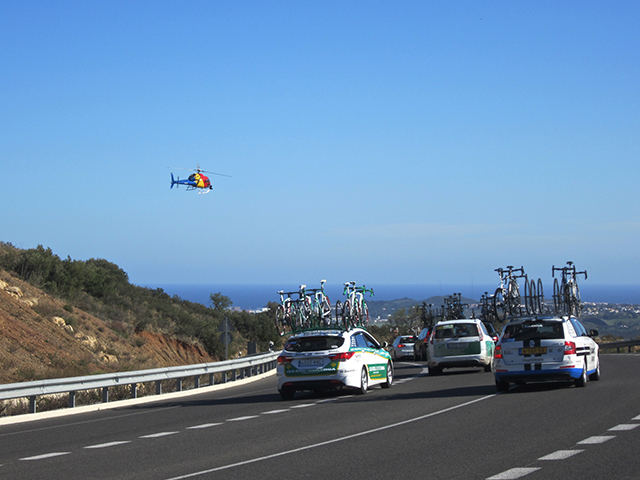 SIR BRADLEY WIGGINS AND GERAINT THOMAS SPONSORED BY SKY, COMPETE IN THE 700KM TOUR OF ANDALUCIA. 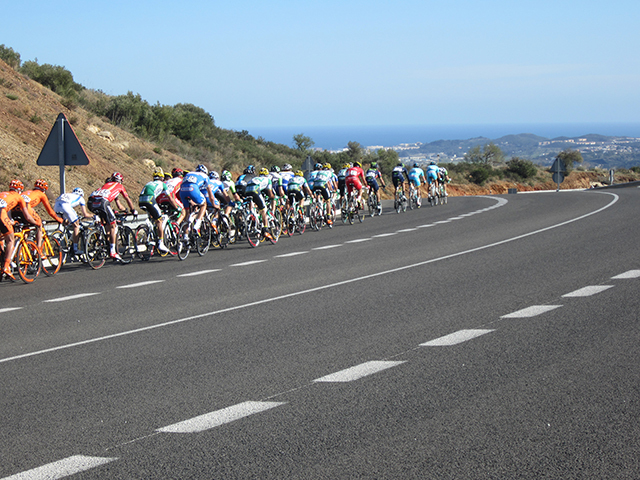 THE LAST LEG OF THE RACE PASSING JUST 500 MTRS FROM CASA LIMONES AND LOS OLIVOS FOR THE DOWNHILL RACE TO THE FINISH AT FUENGIROLA.